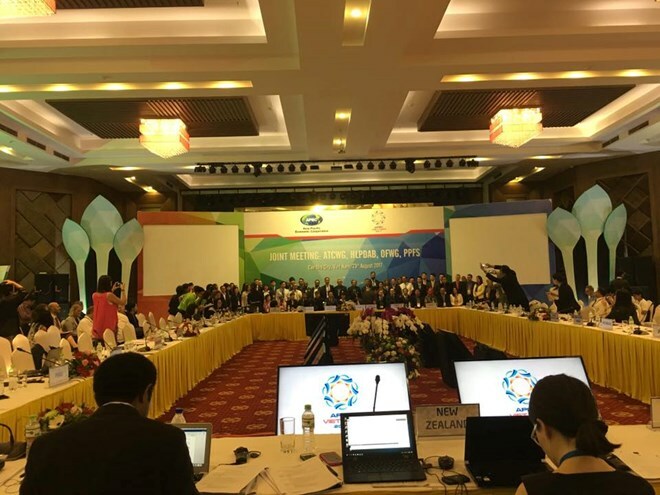 Can Tho (VNA) – Several groups of the Asia-Pacific Economic Cooperation (APEC) met in the Mekong Delta city of Can Tho on August 23 to discuss how to coordinate their activities in terms of food security and climate change. They are the Agricultural Technical Cooperation Working Group (ATCWG), the Policy Partnership on Food Security (PPFS), the Oceans and Fisheries Working Group (OFWG), and the High-Level Policy Dialogue on Agricultural Biotechnology (HLPDAB). Deputy Minister of Agriculture and Rural Development Le Quoc Doanh told reporters that this is the first joint meeting of the four groups, aiming to share experience, avoid overlapping activities and cooperate effectively. The groups considered whether they should meet for the second time in 2018 and evaluated the meeting's contribution to coordination in enhancing food security among the APEC economies. They also looked into the draft Can Tho Statement on Enhancing Food Security and Sustainable Agriculture in Response to Climate Change, the Food Security and Climate Change Multi-Year Action Plan for 2018-2020 and the Action Plan on Rural-Urban Development to Strengthen Food Security and Quality Growth. Asked about cooperation prospects of the four groups after this meeting, Patrick Moran, OFWG Lead Shepherd, said that the event offers an opportunity to improve collaboration between the four groups, which is consistent with APEC goals that all groups work together so that food security dialogues can represent interests of the economies. He said it is important to recognise that seafood and aquaculture play a major role in food security in the APEC region. Patrick Moran praised Vietnam’s initiatives in the Food Security Week, saying the country has done an excellent job.